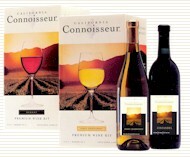 California Connoisseur is a celebration of sunshine. Made from the finest grape concentrates California has to offer, California Connoisseur has become synonymous with outstanding wines of distinctive character, worthy of being served to all who appreciate the proud heritage of the vintner�s art. In as little as 28 days you can create wines of impressive bouquet, flavour and structure. Available in 6 and 30 bottle sizes.